Oswald nearly failed the weapons qualification course during Marine Corps boot camp and barely qualified as "Marksman," the lowest designation in their weapons training program. This photo of Lee Harvey Oswald holding the rifle allegedly used to kill JFK was published on the cover of Life Magazine (Feb. 1964). At the time it convinced most Americans Oswald was guilty of assassinating President Kennedy. In 1964, most people didn't know you could create a fake photo by taking the head of one person and placing it on the body of another. 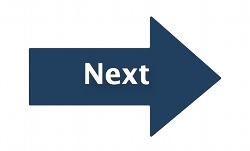 But with the advent of photo editing programs like Photoshop, now nearly everyone knows how easy it is. Perhaps the most obvious sign that this photo was faked is the shadow under the nose, as compared to the shadow cast by the body. In this photo, where Oswald is allegedly holding the rifle, the shadow under the nose indicates the photo was taken mid-day, while the sun was high in the sky. But the shadow cast by the body indicates that part of the photo was taken when the sun was much lower in the sky (early morning or late afternoon). Both would not be possible if this was a geniune photograph. In the same photo, notice that Oswald has a square chin and high cheek bones. But in the photo taken at the time of his arrest (above right), he has a pointy chin and does not have high cheek bones. Other evidence that points to fakery is the fact that the Mannlicher-Carcanno rifle entered into evidence by the Warren Commission was 40.2 inches in length. 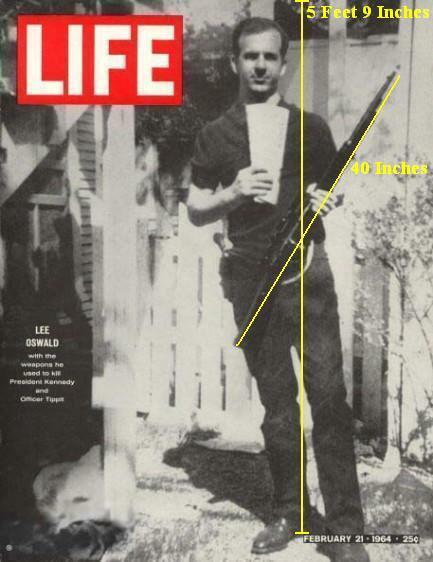 Using the known length of the rifle allows us to use it as a yardstick which shows that in this photo "Oswald" was several inches shorter than his actual height of 5'9". Click here to learn more about how the backyard photos were used to frame Lee Harvey Oswald. 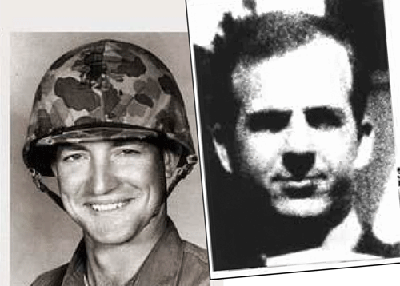 - Oswald and Roscoe White had been part of the same Marine unit and previously served together at 3 separate bases. - The Whites and the Oswalds both moved to Dallas in 1963. - Roscoe White’s wife worked at the Carousel Club for Jack Ruby in 1963. - Roscoe White was a member of the Dallas Police Force in 1963 and was a photographic expert. - The Whites prospered financially immediately after the JFK assassination. - On his deathbed, Roscoe White admitted to his pastor that he had killed several people under contract for the CIA in the USA and abroad. - An original copy of the infamous Oswald backyard photo with rifle, pistol and an Oswald autopsy photo were found among Roscoe White's personal effects after his death. - Mobster Sam Giancana named Roscoe White as J.D. Tippit’s killer to his brother Chuck in the mid 1970’s. Sam Giancana’s memoirs were not published until 1992. 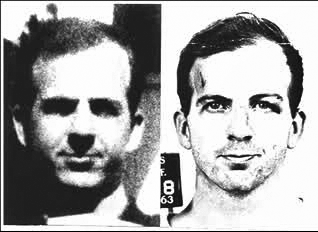 Many researchers believe that Oswald's face was placed on Roscoe White's body to create the infamous backyard photo alledged to be Oswald holding the rifle and Communist newspaper. I don't know about you, but Roscoe White's chin and cheek bones look a lot more like those seen in the backyard photo than do Oswald's chin and cheek bones.